We are amongst the well-known names in the industry, engaged in manufacturing and supplying an exclusive range of attractively designed range of Canvas Paintings. 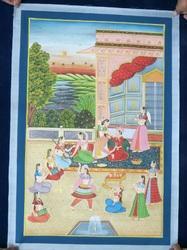 We design these Canvas Paintings in different designs and sizes according to the various clients’ requirements. We have a talented team of designers that utilize optimum quality colors and canvas in order to ensuring its optimum quality and long functional life. Further entire range of painting we offered is checked on various parameters before delivering it to clients' end. Cloth Canvas Painting offered is made available by us in various designs and support the demands of providing enhanced beauty to the interior spaces. The intricate appealing looks of these paintings also help in absolutely mesmerizing the onlookers. As a quality interior décor and gift item, these paintings flawlessly depict creativity of our artists. Some of its features include beautiful art works at the most affordable price, have designer look and aesthetic appearance. 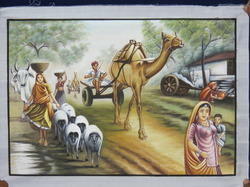 Canvas Camel Painting offered comprises enchanting range of paintings on canvas and shows the rural side of Rajasthan. The enchanting use of colors, artistic finish and finely defined figures in detailed coloring also make these paintings look real and are best choice to be framed and used as an interior décor item. Some of its features include quality finished paintings, available in other different themes, fine balance of color and details, perfect choice to be used as interior decorative item. 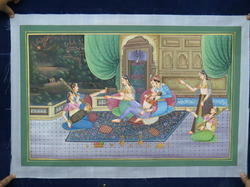 Raja Rani Canvas Painting offered bear intricate artwork finish and come designed using plethora of colors so as to provide in it high attraction values. The mesmerizing patterns and availability of paintings in different artistic themes also make these highly desired by the customers. Some of its features include choice of different sizes to fit specific décor needs, highly creative finish filled with multitude of colors, supports enhancing beauty of interiors, lively expressions and appealing looks, beautiful art works that depicts creativity of our artists at most affordable price.